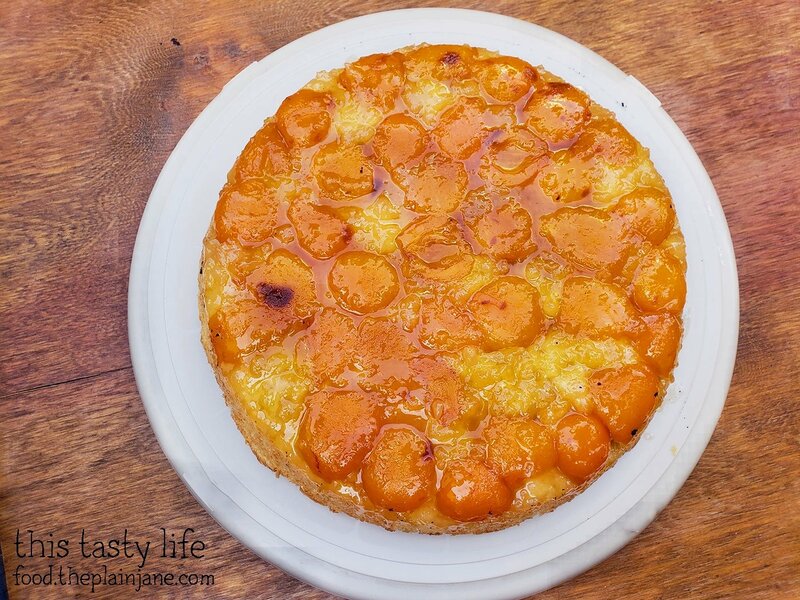 I was inspired to make this Loquat Upside Down Cake after I stopped by the Mira Mesa Farmers Market. I was browsing around and I ended up picking up some loquats! Well, that loquat tree died and it no longer there and when I was at the farmers market I saw the fruit and got inspired. I had no idea what I would make when I initially bought them. But I saw a suggestion for using a Rhubarb Upside Down Cake but swapping it for Loquats, which I did! This is the bottom of the cake. That looks like the top. Cause I still need to flip it.That’s how it becomes Loquat Upside Down Cake after all! I liked that the bottom had a nice crispy crust on it. 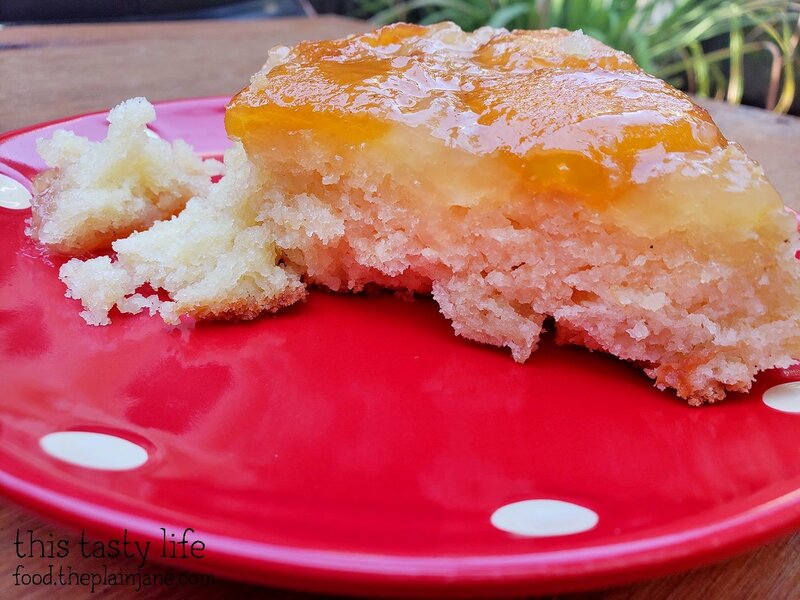 And here’s how the Loquat Upside Down Cake looks after it’s flipped over! The loquat looks gorgeous on top of the cake, don’t you think? The loquat fruit is cooked in a butter-sugar-lemon mixture and a dough is placed on top of that. The dough puffs up and shapes into a cake while it bakes in the oven and forms a golden crust so the cake is a little crunchy on the bottom. 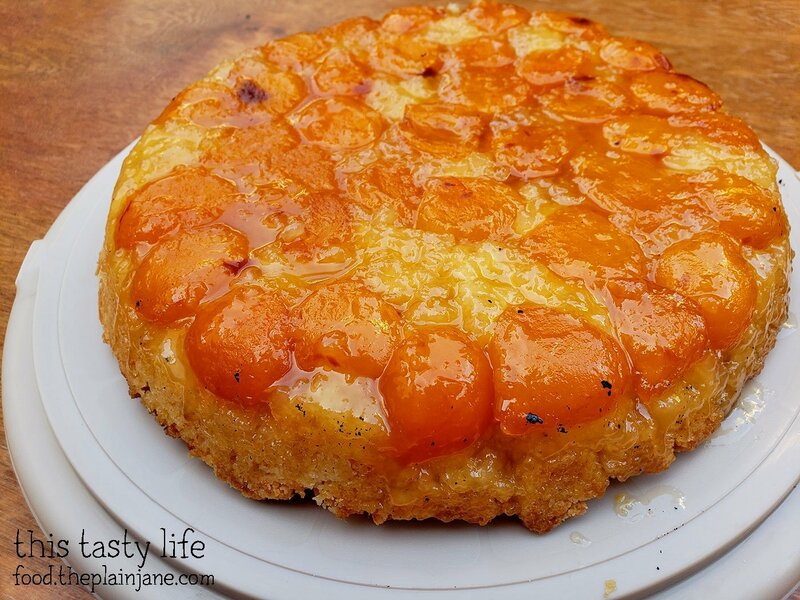 It’s a tender, flaky cake and the cooked loquats are soaked with the lemony butter on top. It’s also not toooooooo super sweet – just right if you ask me. This recipe is definitely a keeper! I’d love to try it with other fruits, like nectarines, peaches, pears, and the classic pineapple. Hope you try it with loquats or another favorite fruit! 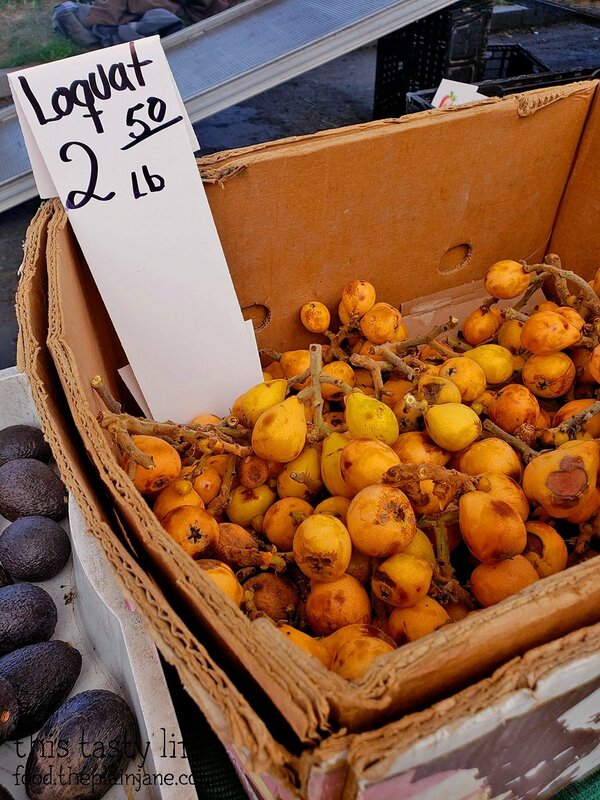 Make sure that your loquats are an orange/yellow color. Best to get them off of the vine or still attached to the vine! Cut the loquats in half and take the seeds out. Peel off the outer skin. You should be able to easily remove the skin when it’s ripe by just pulling it off with your fingers. Rinse loquats and set aside. In a 10 inch cast iron skillet, melt 1 cup of the sugar, 4 tablespoons butter, lemon zest and juice, vanilla, and 1/4 teaspoon of salt over medium heat. When the butter and sugar have melted together into a nice gooey mess, add your loquat and cook, stirring occasionally, until the loquat is tender and slightly caramelized, about 8 minutes. For a prettier presentation, flip all loquats so they are facing the same way (I flipped them so the “hole” side was up). Turn off heat and prepare the cake! Whisk together remaining sugar, salt, flour and baking powder in a bowl. Add remaining butter, and using a pastry cutter (or your fingers), rub into flour mixture to form coarse pea-size pieces (kind of like you’re making biscuits). Add milk and beaten egg and stir until a soft, sticky dough forms. If your egg is on the small side, you may need an extra splash of milk for the dough to come together. Stir until a dough fully forms and all flour is incorporated. Place pieces of dough over the hot loquat butter mixture, covering the whole surface of the pan. The dough will rise up and transform into a luscious cake! 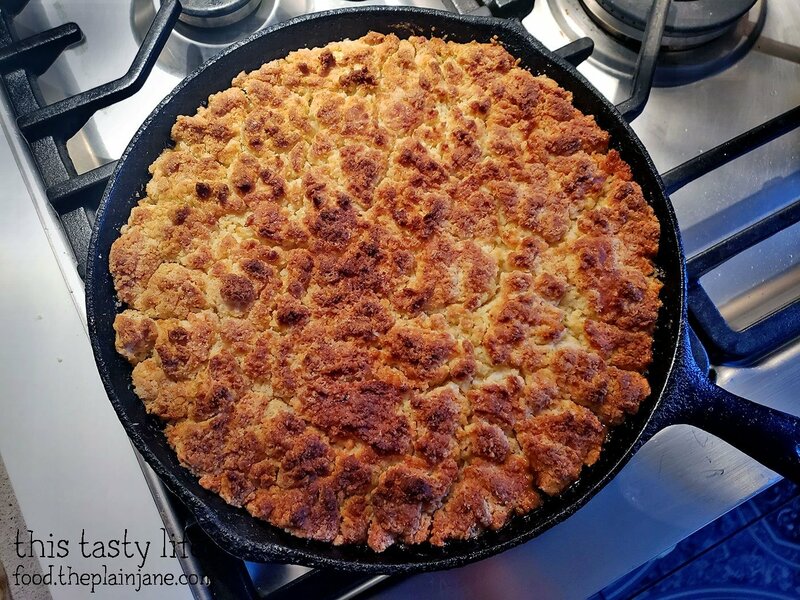 Place cast iron skillet onto a baking sheet and bake until the cake is golden and shining and totally cooked through, about 25 to 30 minutes. Remove from the oven and let the cake rest for 10 minutes. Place a large, flat serving platter on top of the skillet and invert quickly and carefully. Serve warm or at room temperature (warm is best, if you ask me).